Want to feel the breeze of the ocean and the sand between your toes…while in your bathroom? Well, maybe we can’t get all of that just by decorating but we can give your bathroom that “essence de plage” or Beach Essence feel. 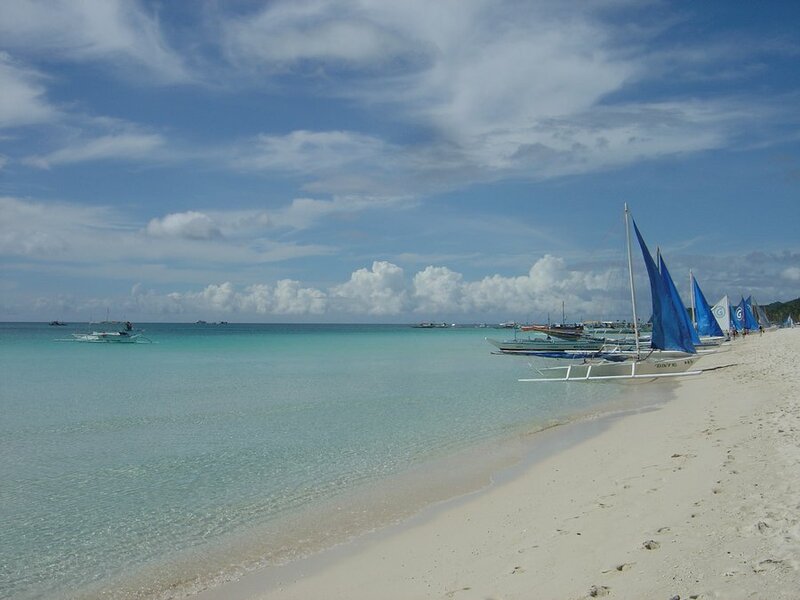 water, sand, air, beach toys, boats and marine accessories, rocks and shells and of course, fun just to name a few. Does that inspire you? I am already starting to get inspired. Let’s start with a wall paint colour. Recently, the trends in paint colours have moved from darker, intense colours to lighter, softer and gentler colours. These colours include some very appropriate beach colours - sea blues, soft water blues, and light aquas – the perfect backdrop for a Beach themed bathroom. Use a soft sea and sky blue to represent just that. Choose a terry cloth shower curtain. These are widely available now - almost everywhere. They are available in several colours but, tend to be found mostly in white, which is perfect. However, if you are creative and can sew, why not make your own…as I did. 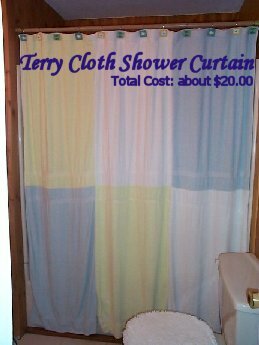 When I made the shower curtain in my children's bathroom, terry cloth shower curtains were not widely available and if they were, they were incredibly expensive. So, I thought I will make one using simple towels sewn together. As I started looking at the towels available and knew that they would be like blocks on the shower curtain, I decided that a colour blocked shower curtain would be perfect. I choose 3 colours - a very light green, a sea and sky light blue and white. With a bit of measuring, I calculated that I would need 6 of these towels. With no finishing required :-), I sewed them together. I used grommets for the shower curtain ring holes. They can be purchased at your local hardware or sewing supplies store. Voila…I had a terry cloth, colour blocked shower curtain...for about $20.00! Any type of sand coloured flooring would be wonderful…and how appropriate! It would probably be best to use a tan coloured ceramic tile. "I can afford it" Tips : Or find a vinyl floor covering which resembles a sandy coloured ceramic tile. "I can afford it" Tips : Use polished rocks to decorate. Add them to create a frame on a simple mirror. Or make a border on the wall with these gorgeous rocks. A ceramic tile glue works well for these tasks. How about using these rocks to fill a glass jar for display - a simple, yet effective and beautiful accessory. Seashells could be used in the same way as the decorative polished rocks. They will probably give you even more impact than the rocks as they generally have more variety in their natural shapes and sizes. 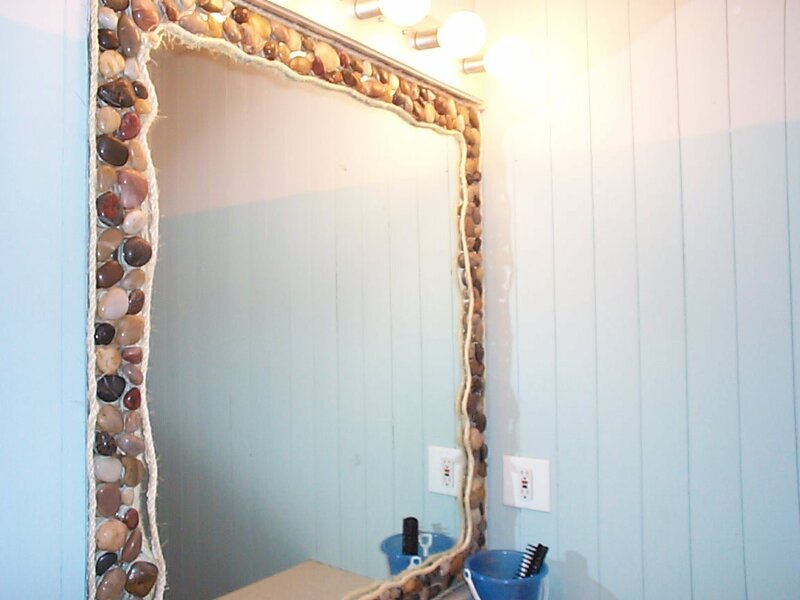 You might try using the seashells as a decorative border on your mirror and rocks as a wall border. Find some creative uses for natural rope twine. Make a border on the walls with the rope. Staple it on the walls or use small finish nails to hold it in place. Or, wrap it around a plain mirror to turn it from simple to sensational. Note: Don’t use hot glue in a bathroom, as it will not stand up to the moisture. Loops of rope could be made to hang your shower curtain – very cute, inexpensive and much nicer than any plastic shower curtain ring. Use all three of these inexpensive decorating items, polished rocks, seashells and rope, in some unique and creative way. There are hundreds of ways to do this. Shelly's "I can afford it" Project - Plain mirror bordered in polished stones/rocks and rough twine-type rope. For a more luxurious essence de plage bathroom, get yourself a teak floor mat to place beside your tub or shower. This is a flat slatted shelf-like item that goes on the floor. It is meant to act somewhat like a drain board – the excess water will go through the slats. This is especially for the finest of beach home bathrooms! For those green, organic environmentalists (like myself), new on the market are some wood products made of the renewable resource, bamboo. (Bamboo grows extremely fast making it highly renewable.) You can find bath mats, small stool benches and more...providing you with a very similar, but, lighter wood look, of teak. Don't forget about some new towels. Pick some in the same colour scheme we have already established. White is great for a clean, fresh beach look. Blues and tans will make for a less formal looking beach theme - great for kids. If this is a children’s bathroom, use fun beach nautical themed accessories – and I really mean fun accessories. For example, I used sand buckets/pails as storage units on the countertop - great for hairbrushes and other hair goodies (for the little girl in the house), toothbrushes, toothpaste, and more. Store extra rolls of toilet paper in a large sand bucket on the floor. When not in use as storage containers, the kids will love them in the tub. How fun and truly an “I can afford it” accessory! If you are not inclined to do-it-yourself, then you can always shop for beach themed bathroom products and get the look and feel without any work involved. Shop now for nautical beach themed bathroom decor and accessories to get your own essence de plage bathroom! Copyrighted 2006 – Inspired Interiors by Shelly Whitney - Shelly Whitney is an Interior Designer and Decorator with "funked-up flare" and a penchant for decorating on a budget. She employs "I can afford it" tips and tricks in all of her articles and projects.